Welcome to my eBay Book Store. 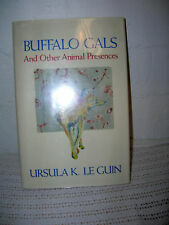 We started selling used, vintage & rare books at French Markets in the Chicago suburbs. 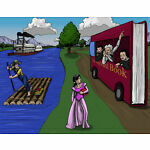 Based in Naperville, IL, we now offer cool fiction, non-fiction, history, cookbooks & children's books online. Add me to your list of favorite sellers and come often. Thank you! Foods For Glamour By Jack LaLanne w/DJ 1961 First Edition Second Printing BOFFO! 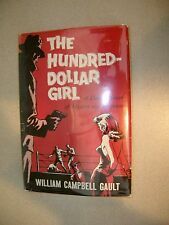 The Hundred-Dollar Girl By William Campbell Gault 1961 Hardcover DJ First Ed.!!! 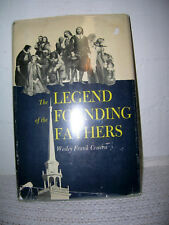 The Legend of the Founding Fathers by Welsley Frank Craven 1956 1st Prnt. HC/DJ! Boomerang By Barry Hannah 1989 First Edition First Printing HC / DJ Great Shape! LOVE I Corinthians 13 by Peter Thomas 1989 Miniature Book Numbered WAY COOL! Steve Mather of the National Parks by Robert Shankland 1951 1st Editon EXTRAS! Family Grandstand By Carol Ryrie Brink Illus Jean M. Porter 1952 1st Edition DJ! I Was Jacqueline Kennedy's Dressmaker By Mini Rhea w/ F. S. Leighton First Ed. Hello, Mrs. Goose! 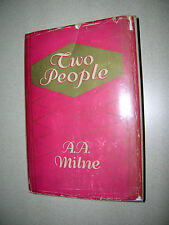 by Miriam Clark Potter 1947 Illustrated 1st Edition HC w/ DJ! 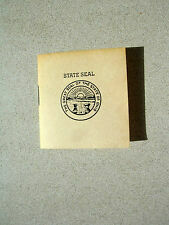 Nancy Naylor Flies South By Elisabeth Lansing 1st Edition 1943 Dustjacket NICE! The Ladder of Snow By Showell Styles 1962 First Edition with Dustjacket NICE! The Looking Glass Book of Stories H D Leavitt, Editor 1960 Terrific Condition! From An Abandoned Work by Samuel Beckett 1958 Faber & Faber Scarce Booklet - DJ! The Snow Kings Story & Pictures by Ellen Shire 1969 First Edition Good DJ Cool! Historic Towns of New England Lyman Powell, Ed. 2nd Edition 3rd Imp 1899 Superb! The Portable Greek Reader W. H. Auden Editor 1950 2nd Printing HC/DJ Great Cond! Wisher by Charles M Daugerty Illus By James Daugherty 1960 1st Edition DJ CATS! Soft Touch By John D. MacDonald 1958 Dell True First Ed. 1st Prtng. Great Shape! Have a Match? by Robert E Massman 1988 Ltd Edition Miniature Nested In Matchbox! Album of Dinosaurs By Tom McGowen Illus. By Rod Ruth 1975 Hardcover Fantastic! Troubled Sleep By Jean-Paul Sartre 1951 with Dust Jacket RARE! Take Joy! The Tasha Tudor Christmas Book 1966 Second Printing HC / DJ! Held For Orders Tales of a Railroad Life Frank H. Spearman 1902 1st Ed 3rd Impr. The Blood Bay Colt by Walter Farley 1950 First Printing DJ Great Shape! When I Have A Little Girl By Charlotte Zolotow Illus by Hilary Knight 1965 COOL! Buddy in School By Howard R Garis 1929 1st Edition (?) Dust Jacket WOW!